Enjoy the last week of GrabRewards Stamp Card! From 11 Mar – 7 Apr, complete 4 rides using GrabPay Credits every week to unlock $3 x 3 rewards, and 8 rides to unlock $4 x 3 rewards. It’s really that simple! Click here to learn how to make GrabPay Credits your default payment method. This campaign runs from 11 March – 7 April 2019. Exclusive to Gold and Platinum members only. Stamp count resets every week on Monday at 12am. Each user may only collect up to 8 stamps in a week (Monday to Sunday). 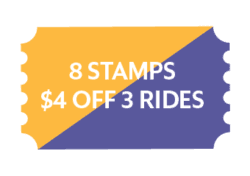 Users need to accumulate 4 stamps within a week (Monday to Sunday) to unlock the $3 off on 3 rides, and 8 stamps within a week (Monday to Sunday) to unlock the $4 off on 3 rides. Valid across all rides paid using GrabPay Credits except GrabHitch, GrabWheels, GrabCoach, and GrabShuttle. Customers can earn 3 x $3 Grab ride promos with every four (4) Grab rides paid via GrabPay Credits per week. This reward is valid for 2 weeks from the date of award. Customers can earn 3 x $4 Grab ride promos with every eight (8) Grab rides paid via GrabPay Credits per week. Valid for all Grab rides except GrabHitch, GrabWheels, GrabShare Minibus, GrabCoach, GrabShuttle and GrabWheels.